I’m still digesting this book, and plan to write on my other blog about how it’s affected my views about schooling, and how it’s impacting my thoughts on how to move forward in my own homeschooling endeavors, but for now I’m going to try to share some general thoughts about the book and its premises. Free to Learn was recommended to me by a friend when I put out a request on Facebook for suggestions of books about unschooling. I immediately ordered it from Amazon and spent the next week devouring it, highlighter in hand. In a nutshell, the basic message of Free to Learn is that kids learn best by being left alone by adults. That is not to say that children should not be cared for, nurtured, and provided for by adults, but we, as a society, have gotten to a point of believing that adults must direct every aspect of our children’s lives, including their learning. For some reason we went from trusting children and believing them to be competent and having faith that their natural curiosity would serve as a strong enough drive to lead them down the paths of learning what they need to know, to believing that children are inept blobs of clay who must be molded into desirable shapes, and who can’t or won’t accomplish anything of use without supervision, direction and coercion by adults. You really can’t help but see that this is the model of conventional schools. The whole idea of compulsory schooling, with its compulsory subjects that must be learned in prescribed ways at prescribed ages (prescribed by anonymous adults who are far, far removed from classrooms), with its grouping children together by age rather than by interest or desire to be grouped together, with its never-ending ranking, grading, comparing, testing, rewarding, and doling out of consequences, with its adherence to conformity – all of these things that characterize pretty much every neighborhood public school fly in the face of how children actually learn best. By sucking all the joy out of learning for learning’s sake and instead making learning a means to an end (a good grade, a gold star, an award, something to put on a college application), we are failing our children. Rates of depression, anxiety, and cheating in school have skyrocketed, and we’re raising kids who increasingly don’t have any idea how to run their own lives and make their own decisions, let alone take responsibility for the direction their lives may take, face adversity, and learn and grow from their mistakes. 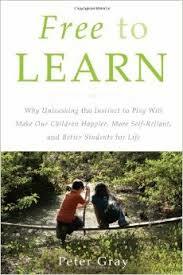 The key to real learning, posits Peter Gray, is a childhood full of free play, and a democratic model of education. What this translates to is that children should be given as much freedom as is safe and reasonable (and those are subjective, and therefore raise plenty of questions about what is safe and reasonable) to direct their own learning, to interact and form friendships with people outside of their own age groups, to explore, experiment, and just play – and adults need to back off and trust that the kids will be alright if we stop managing their every waking moment. So much of this struck a deep chord in me. I absolutely see the truth of all of it. The problem is making the leap to applying these principles in real life when you’ve become so entrenched in the “conventional” way of doing things. While I absolutely see the wisdom and truth of what Gray sets forth, I’m having a very, very difficult time actually thinking about what it would be like to let go and give my kids the reins. Two criticisms I have: on some level, this book feels like a giant advertisement for the Sudbury Valley School and its offshoots. Sudbury schools are democratic schools in which the students direct and take complete responsibility for their own education. I can’t imagine that it’s not wonderful, and that it doesn’t instill in kids a myriad of things that conventional schools can’t or won’t. My problem with the endorsement, though, lies in the fact that Sudbury schools are private, tuition-based schools, and although they are apparently less expensive than a lot of conventional private schools, they’re still not cheap, and many, many families – especially those with multiple kids – just cannot afford to pay tuition to send their kids to school. Further, relatively speaking, there aren’t a whole lot of these schools. The numbers are growing, but it’s not like you can find one in every neighborhood, so most families will have to commute at least some distance, and this isn’t practical or even feasible for a lot of families. The other thing is that I wish this book, and other books that discuss alternative educational paths for children, talked about how these methods might apply to a-typical kids (i.e., kids with disabilities). I feel like just about every book or article out there that discusses all the wonderful ways in which children can be educated and reared outside of conventional standards are really talking about “typical” kids. How do kids with intellectual disabilities fit into all of this? Nobody really seems to want to delve into that in any depth, and that’s a disappointment. In any case, I think this book is a must read for anyone who has kids or plans to have kids. Seriously, a must read.